Booth vs. Webstore: What’s the Difference? 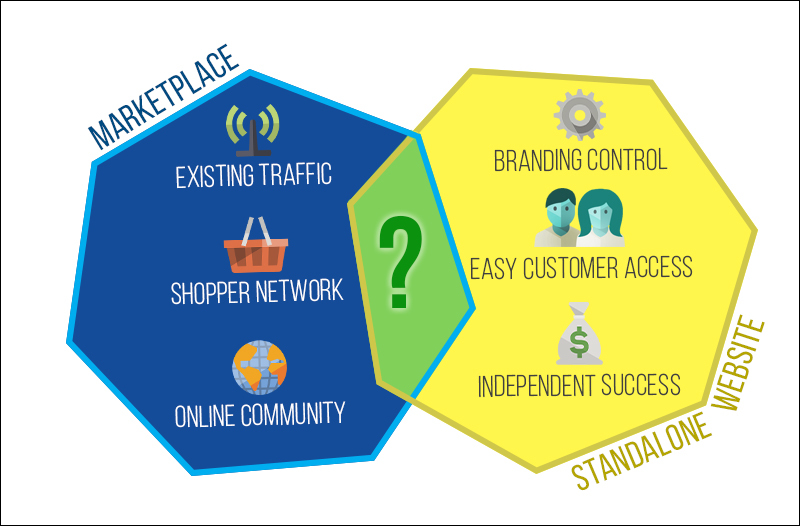 The choice between a marketplace and a standalone website is not easy. On one hand, if you choose to sell on a marketplace, the potential traffic for your items is immense, but there are limited branding options. However, if you choose to sell on your own website, you get control over your brand and customers, but you have to generate your own traffic. Selling on a marketplace while also maintaining a standalone site can be a big hassle - no one wants to take the time to learn multiple platforms and try to keep your inventory in sync between the two. But what if you didn’t have to choose between one or the other - what if there was a third option that’s a perfect middle ground? Look no further - Bonanza Webstores is the best of both worlds. With Webstores, you get a marketplace with millions of shoppers, plus a standalone store where you have control of your brand. And, you can manage all your inventory from a single place with an award-winning user interface. 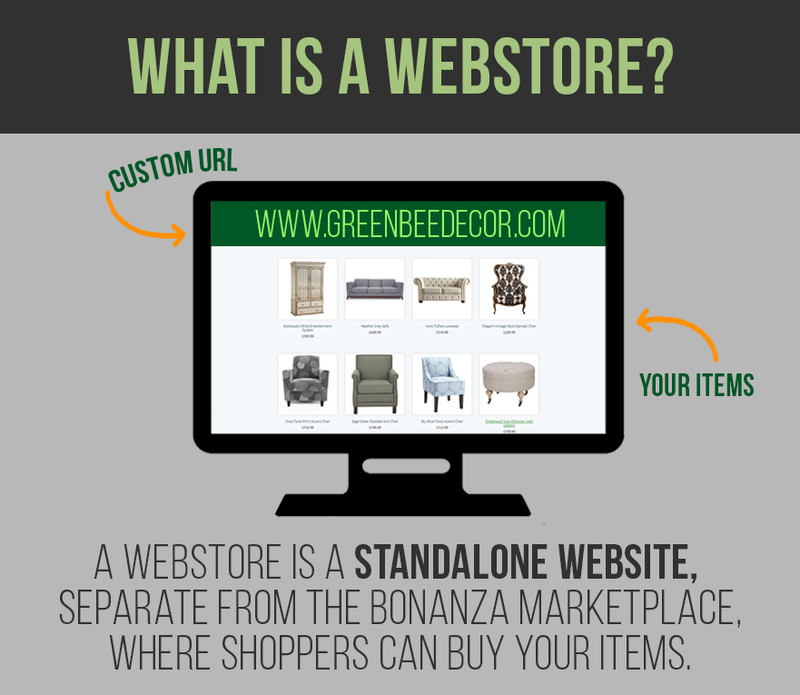 Now that you know Bonanza has developed a way to access the benefits of both a marketplace and a standalone site, it’s time to find out what exactly a Webstore is and how it differs from a Bonanza Booth. Inquiring minds want to know: What is a Webstore? A Webstore is a standalone website, separate from the Bonanza Marketplace, where shoppers can buy your items. It is a place where you get to create your brand and control your online presence. You can make your Bonanza Webstore your own by choosing a personalized URL and one of several unique designs and other customizations. Do I need to have a booth to open a Webstore? Importing current inventory from another marketplace. If you've already got your inventory posted on eBay, Amazon, Etsy, or in a CSV file, you can import into your Bonanza booth for free. Smart and easy batch editing. Bonanza's seller tools have been consistently ranked #1 for a reason. We were built as a platform for sellers with lots of items, and we've built out a robust toolset for helping big sellers manage lots of items with minimum effort. Generate CPA-based traffic (if you want). With a Bonanza booth, you have the option of publishing your products to Google Shopping, eBay, BingAds and the Bonanza Affiliate Network with one simple click. It costs you nothing unless you make a sale, and you decide up-front how much you'll pay when you do make a sale. I already have a Bonanza booth. Why should I get a Webstore? Selling on a marketplace is great, but if you've ever wanted your own "stand alone" ecommerce website, then Webstores is your solution. Webstores are perfect for sellers that want to build their own brand, or want an easier way to manage their existing brand. So, Booth vs. Webstore: what’s the difference? The major differences we’ll discuss are in pricing, item listings, customization, and advertising. Whether you’re using your booth or your Webstore, it is always free to list an item. However, the sale of an item is handled differently in a booth and a Webstore. In your booth, any items sold are subject to final value fees (a commission percentage charged on the final price of your sale). For more information about final value fees, check out our pricing example page. When an item is sold on your Webstore, you keep 100% of the money made from the sale. The only fee associated with having a Webstore is a $25 monthly subscription fee. The annual plan provides sellers with the best value at $255 per year (bonus: the annual plan offers a free custom domain name). 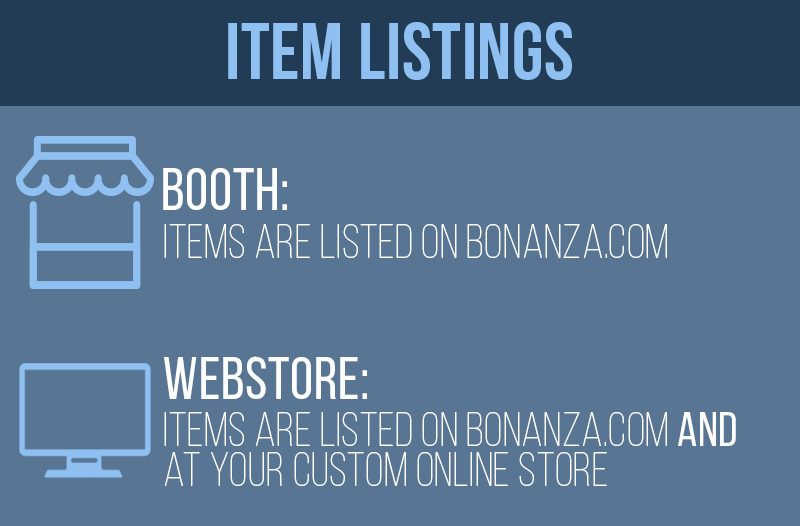 When you list an item in your booth, it is searchable on Bonanza.com. That means that any time a shopper visits Bonanza.com and searches for an item like yours, it will appear in the search results. When you list an item on your Webstore, it is still listed on Bonanza.com. It is also available at your custom website. This means that with a Webstore, your items are getting exposure in two places. #protip: Still confused about where your items will be displayed? Check out our demo Webstore, www.greenbeedecor.com and our demo Booth, www.bonanza.com/booths/greenbeedecor. You can see that the same products are available in both places, because they both share the same inventory. With a booth, you have one visual customization option. 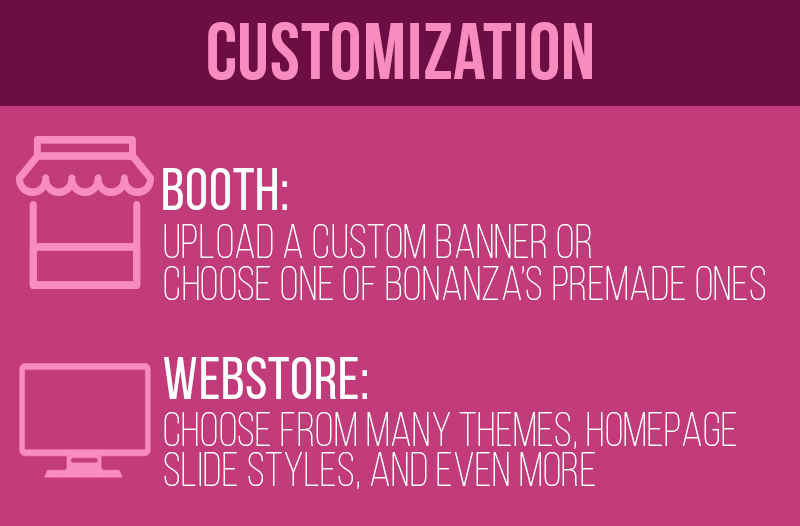 You have the ability to upload a custom banner for your booth, select one of the pre-made banners provided by Bonanza, or simply leave your banner blank. With a Webstore, the sky's the limit with customization. We offer 10+ unique Webstore themes to choose from, so you can get a Webstore that fits the feel of your products. We also offer a variety of different banner options, including GIF images and promotional videos. You can also choose which products you’d like to be displayed on your homepage. For more information on customizing your Webstore, check out this guide to Webstore customization. 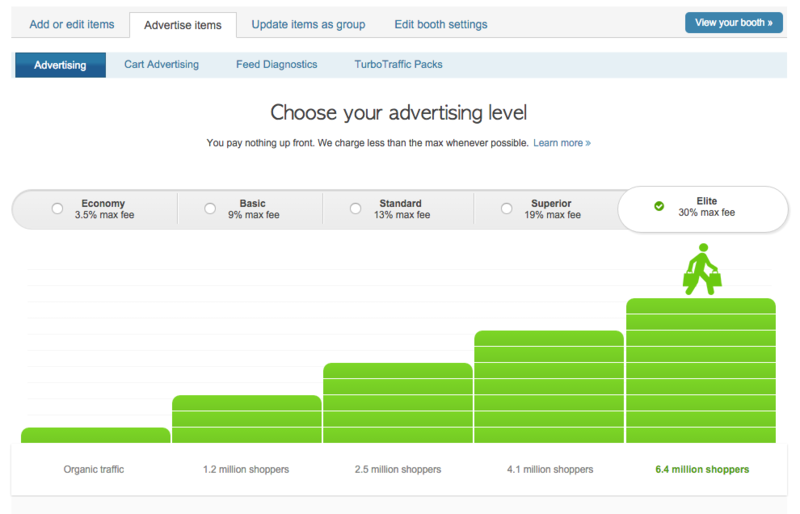 When you opt into Bonanza Advertising platforms from your "Selling > Advertise items" page, the traffic generated will be directed to your marketplace booth, NOT to your Webstore. Purchases made from your marketplace booth are still subject to final value fees. Sellers are not permitted to refund buyers who purchased tangible or digital items from their marketplace booth and redirect the buyer to checkout via the Webstore. Webstore Broadcaster: Bonanza has partnered with Google Shopping to make it easy for sellers to publish their Webstore listings on Google Shopping (no in-depth knowledge of Google Ad Words required). Details about the Webstore Broadcaster can be found on this page. Social Media: Create social media accounts for your store on popular networks such as Twitter, Facebook, Instagram, and Pinterest. Post frequently to quickly increase your followers. To get the highest level of engagement from your followers, be sure to include rich media such as images and video whenever possible. Be sure to read our guide to Webstore social media strategy. Friends and Family: Email your friends and family to tell them about your new store, and invite them to forward the email to anybody they know who might also be interested in checking it out. Some of the best customers come from friend and family referrals. Include a link to your standalone Webstore in your email signature and on business cards. Search Engines: To get found on search engines like Google and Bing, be sure to create informational pages on your Webstore - Bonanza will notify the search engines via your sitemap, which is created automatically and submitted for you behind the scenes. Your customers will appreciate the information, and the search engines will start to see you as an authority in your category - which means they'll rank you higher. Orders from your Webstore will still appear in your booth under the items sold page, so you still manage and fulfill orders from the same place. 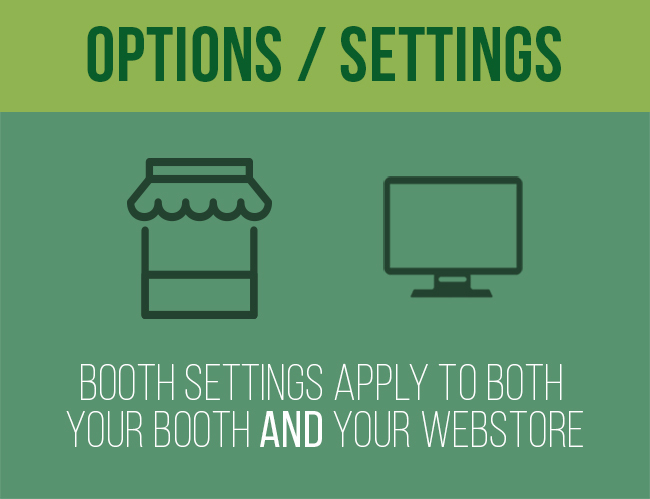 The options you select for your booth settings are the options available for your Webstore. For example, if your booth offers one freebie item per purchase, your Webstore will also allow one freebie item per purchase. 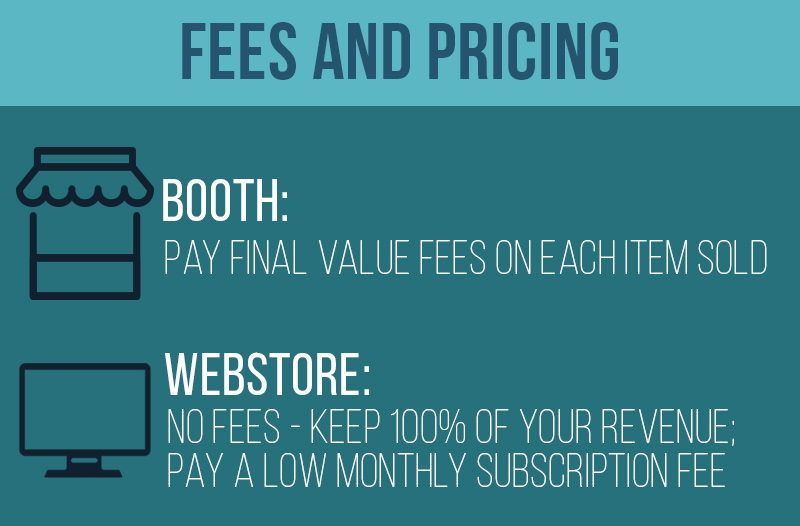 Similarly, the payment options available for your booth are the same options available in your Webstore. You can accept payment via PayPal and Amazon Payments. In the world of ecommerce, there are countless choices online sellers have to make. It can seem like an impossible task to try and choose between an online marketplace with established shoppers and a supportive community, or a standalone website where you can control your branding and customization. With Bonanza Webstores, you don’t have to choose. Now, you can access millions of shoppers through the marketplace while also building your own brand at your standalone site. So, what are you waiting for? Sign up for a Webstore today.